Look over the results from the first three nights of Speedweeks at New Smyrna Speedway in the Super Late Models and there are plenty of familiar names. Names like Hantz, Fritts, Kittleson, Middleton, Christopher, Landis, Rogers and Mathews are just a few. However, then come to Michel Jourdain Jr. Who? But ppc and Ford didn’t just want Jourdain to get some seat time. They wanted him to learn. And what better teacher to teach an all out rookie in every sense of the term in Super Late Models than one of the best Super Late Model drivers ever… Freddie Query. 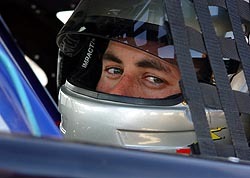 “It started when I built a car for Greg Boone in the #59 car and I was supposed to come down (to Speedweeks) with him,” said Query, a multi-time track champion at Concord Motorsport Park (NC). 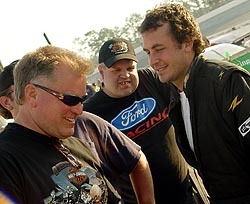 “Then Ryan Crane (who Query also helps out) decided he was going to come down to Speedweeks. “Michel is with ppc and Ford and has a full-time Busch ride, but wasn't approved for Daytona (by NASCAR). Ford and ppc wanted him racing something because he's never raced stock cars. So they called me and asked if I could make it happen. They told me that this kid was as coachable as anyone I would ever work with and that the kid would stand on the gas. So I said, I will work with that. Jourdain is a former CART Indy Car racer who is slowly making a transition into the world of stock car racing. During the off season, it was announced that Jourdain would race in the NASCAR Busch Series with ppc Racing. However, before the season started, ppc and Ford wanted Jourdain to get as much seat time as possible. And what better seat time, especially seat time learning how to beat and bang with a stock car as opposed to staying clear with an open-wheel Indy Car, than seat time at the World Series of Asphalt Stock Car Racing at New Smyrna Speedway. “When we decided to do the Busch deal with ppc and Ford, this is one of the things they wanted me to do is these races,” said Jourdain in broken but well spoken English. 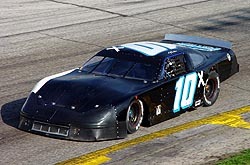 From there, Query was in fast motion to get the car ready to Michel and the grueling timeline of nine nights of action at Speedweeks at the ultra-fast and rarely forgiving New Smyrna Speedway. This car was a Jimmy Cope car just a few weeks before Query got ahold of his for Jourdain. Jourdain was a quick learner. On the first night of action, Jourdain qualified fifth. He raced in the top-five most of the night before getting together with Mike Fritts and having to come from the back. On the second night of action, he was the second quick qualifier. He had another great race going, running in the lead before eventually falling to second and spinning while trying to hold off eventual race winner Louis Mechalides. On Sunday night, the third night of Speedweek action, Jourdain again qualified in the top 10 before a bump from Mike Fritts sent him spinning while racing comfortably in the third position. Again, Jourdain had to work from the back of the field and moved back up toward the front before the night was over. However, the results don’t quite tell the story of all Jourdain has had to learn about racing stock cars as compared to Indy Cars in just a few days time frame. “I hear he went to Daytona to test for the first time and he knocked all the cones down,” added Query. “They set up those orange cones to line you up on pit road and he knocked them down because he had never sat on the left hand side of a racecar and had six feet over there next to him. He is used to sitting in the middle. Jourdain was a mainstay with the CART Champ Car Series since making his first race in 1996, when he became the youngest driver to ever compete at the age of 19. 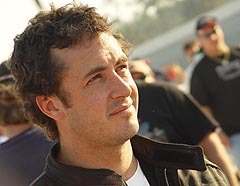 Between 1996 and 2003, Jourdain made a total of 152 career Champ Car starts, earned one pole and finished on the podium nine times. However, it wasn’t until 2002 and 2003 when he came into his own. In 2003, Jourdain set a Champ Car record by leading 234 laps in route to his first career victory, which ironically came on an oval, at the Milwaukee Mile. He followed that up with another win later in 2004 at Montreal. That same season, he finished third in series point standings. “Three weeks ago, he hadn't sat anywhere but the middle of a racecar. So to come here and do what he has done is amazing. (Saturday) night, he made two spectacular saves. I mean you don't learn that. You can't teach that. If you don't have that stuff in there, you are going to wreck a lot. If you are going to lose it, you are going to spin and hit the wall most of the time. Jourdain was also impressed with his success and his take to the cars, but was modest and placed a lot of the success on Query’s shoulders. Query (left) and Jourdain (right) talk before qualifying on Sunday at New Smyrna. worried about making races. These short tracks are hard and these guys are very, very good. They are not only very good, but they drive these cars all the time. It is hard to come in with a good race car and be good. We just want to finish the race each night and we will be happy. “This is fantastic. I am having a lot of fun. I’ve learned so, so much… especially with Freddie. The guy has taught me a lot . Query is glad to help. because of commitments at Daytona, is a kid of very few words… probably because it takes him longer to speak than most. But the foreign driver already speaks very highly of his experiences at Speedweeks and the experienced teacher guiding him along he way. “When they invert the field, I’ve been very lucky. I’ve had about the same starting position for the three nights. “It is hard because these guys are beating on each other. There is no room for mistakes. I am learning so much, and that is the main goal. Jourdain has been fast every night at Smyrna. “The biggest help I have given him is just like the same thing that you would tell someone who hadn't been to a particular track before; where the line is. That's pretty much it because he is a racer. I mean he is a damn racer!